With the Ontario Library Association Super Conference fast approaching, it seems appropriate to acknowledge another OLA program that is engaging children across the province right now: the OLA Forest of Reading. In the months between the announcement of the nominees and the awards ceremony in June*, participants read or are read books from the shortlists in their age category and vote for their favourite. The awards are presented at the Festival of Trees in Toronto, where hundreds of eager school children meet and cheer on their favourite authors. 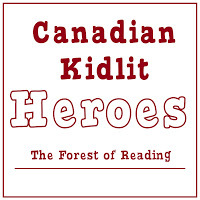 With more than 250,000 readers participating each year through their school or public library, the Forest of Reading is the largest program of its kind in Canada. To learn more, visit the Ontario Library Association website. Not a resident of Ontario? Many other provinces and regions in Canada have readers’ choice awards. We have already featured the Manitoba Young Readers’ Choice Award and British Columbia’s Chocolate Lily Book Award. We look forward to featuring more! *The Evergreen Award and the Golden Oak Award are presented at different times. “This touching book based on the true story of the Rogers family and a tiny teddy bear brought tears to my eyes and made my son sad for a family who lost a beloved member. Aileen Rogers, a 10 year old girl who lived on a farm in East Farnham, Quebec in 1915, owned a small stuffed bear named Teddy. When her father, Lawrence, enlisted to go fight in the war in Europe, and his letters reveal that he was cold and tired and missed them terribly while in the trenches, she decided to send him her teddy bear to remind him of home and to keep him safe. Did you know that the first library in the British Empire created exclusively for children was the Boys and Girls House in Toronto? Its founder, Lillian H. Smith, was the empire’s first trained children’s librarian and was a pioneer of literary programming for children in Canada. Most of the kidlit heroes we’ve been focusing on this month have been organizations and people who are working with children and books today, but Smith’s legacy is one we could not ignore. The Boys and Girls House is gone now, but the library built to replace it, aptly named the Lillian H. Smith branch, houses the ever-growing collection she began. In 2012 the Toronto Public Library celebrated 100 years of children’s programming—much of which was directed or influenced by Smith. The event was marked by the publication of a list of “100 Books for 100 Years of Children’s Services” (Theo Heras, Mary Anne Cree, Mariella Bertelli, and Martha Scott). Smith founded public libraries in schools; she taught children’s literature courses; she trained new generations of librarians; she wrote an influential book, The Unreluctant Years. Her work with the American Library Association and the Canadian Association of Children’s Librarians helped to make librarianship the profession it is today (source: Lillian H. Smith: A Life in the Library). She loved books. So here’s to Lillian, who helped to shape the libraries we love. “Every morning at dawn, Kato leaves his Ugandan village to begin his challenging barefoot hike to fetch water. Carrying two jerry cans, the boy traverses through grass, down hills, and past cattle in fields guarded by soldiers. When he reaches the village well, he fills the cans with a day’s supply of water. After splashing his weary, dusty feet, Kato begins his long trek home, conveying the heavy containers on his head and in his hand. An aid worker’s truck near the village square catches his attention. The child becomes so excited by what he spots inside the vehicle that he dashes home to look for something special to present to the aid worker in exchange for the life-altering gift… a single white poppy from his garden for brand new shoes! —Senta Ross is a former elementary teacher and teacher-librarian in Kitchener, Ontario. For a subscription to Canadian Children’s Book News, visit the Canadian Children’s Book Centre. “I enjoy the succinct nature of novels in verse. The format does, however, require careful and evocative word choices. The author must say a lot with a little, or the reader is left with too many gaps to fill and too little direction to make sense from. Jill MacLean successfully meets the challenges of the format of a free verse novel in her new book Nix Minus One. The powerful, moving story is told from the first person perspective of 15-year-old grade 9 student, Nixon Humbolt. …The complexities of Maclean’s novel add depth and believability to the story events and the multi-faceted characters she has created. As the flawed and troubled Nix lurches from one situation to the next, the reader is constantly hoping for him to emerge with happiness and success. At his core, he is a brave and caring individual hampered by insecurities, a distinct lack of confidence, and limited ability to verbalize his feelings. Gregory Bryan is a professor of children’s literature at the University of Manitoba in Winnipeg, MB. Every year BC students from kindergarten to grade six read and vote on a list of picture books and novels published in the last year. With resources for teachers and librarians, the program encourages book clubs, letter-writing to authors and illustrators, and activities that foster critical thinking. An annual gala event celebrates the award winners. The chocolate lily is a native British Columbia flower that grows nowhere else in Canada. The Chocolate Lily Book Awards program is one that celebrates the unique literary offerings of British Columbia authors and illustrators. Founded by teacher-librarian Karen Ehrenholz, the Chocolate Lily Book Awards have been encouraging children to read for over ten years. “A simple but powerful story on the value of a gift. I read this book with my son and we had a wonderful discussion on the lives of other children in distant lands and the value we place on material objects. I could see it made him reflect deeply. Rated G: Good, even great at times, generally useful! “Alma Fullerton, author of the award-winning novel Libertad, has created a simple and poignant story about the power of humanitarianism, gratitude, and simple acts of kindness. In his poverty-stricken Ugandan village, one of young Kato’s daily jobs is to make the long trek to the village well to fill his two jerry cans with water. On this day, like all others, Kato passes by other groups of barefoot children along his way, as well as soldiers guarding fields of animals. When he arrives back to the village square, he notices an aid worker’s truck, and is overjoyed when he spots what is inside. He rushes to a field he passed earlier to pick the single poppy that grows there. Kato is first in line when the aid worker begins handing out her treasures to all of the village’s children—brand new pairs of shoes— and presents her in turn with all that he has to offer her, a beautiful symbol of peace. A Good Trade is an eloquently told, beautifully illustrated, and heartfelt story. The children in the book, and Kato in particular, appear to be filled with a deep down happiness and certain light heartedness in spite of their country’s harsh situation. It is quite evident that they do not see their lives as being ones of misfortune, wheras it is simply their reality, and they are at peace with it. As a result, this story could serve as a humble reminder to children to be grateful not only for the material things they have that are normally taken for granted, but for the privilege of living in a country where they do not have to experience this type of day to day existence. Thematic links: Uganda; War; Poverty; Gratitude. “…Nix’s story is one of transformation. Nix is an introvert. He finds relationships difficult, and is more at home expressing himself through the things he makes. A connection he does form his to his neighbour’s neglected (and possibly abused) dog, whom he arranges to start walking every day. With Twig, Nix can do what he can’t do for his sister Roxy. Nix knows that Roxy’s relationship is toxic, but she won’t listen to him. The more out of control she becomes, the more desperate he becomes to protect Twig. What I loved most about this book is the the way that Nix evolves.In the same way that Twig transforms from a sad and frightened animal, Nix transforms from a sad and timid boy into the knight-slaying dragon he wishes he could be. Nix finds strength he didn’t know he possessed- the strength to fight for what matters and protect what he loves no matter how difficult or at how high a cost.